Artist’s depiction of a neutron star. 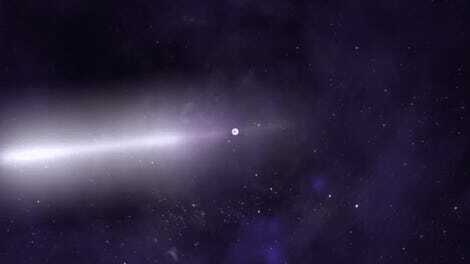 A spinning neutron star is known as a pulsar. Using a new technique, astronomers have documented one of the heaviest neutron stars known to science. It’s an important discovery for astronomers, but the newly recorded object is also providing an unprecedented opportunity to conduct particle physics research from a distance. Neutron stars are among the most fascinating objects in the universe. Often heavier than two Suns put together, these decaying stellar remnants are no wider than a large city. Needless to say, these exotic objects are super-dense and exceptionally round, packing an obscene amount of material into a small space. A typical neutron star, for example, packs around 500,000 times our planet’s total mass into a sphere measuring 12 miles across. Neutron stars form from the decayed shells of stars between 10 to 30 solar masses, where one solar mass equals the mass of our Sun. New research published this week in the Astrophysical Journal describes one of the most massive neutron stars ever detected, an object containing 2.3 solar masses. Only one known neutron star tops it: a behemoth discovered seven years ago that weighed in at 2.4 solar masses. In total, out of the approximately 2,000 neutron stars known to astronomers, only four are more than two solar masses. Super-massive neutron stars are thus relatively rare, and they exist at the limits of what’s physically possible—making them exceptionally important objects of inquiry, both for astronomers and for particle physicists. Artist’s depiction of neutron star PSR J2215+5135 (bottom right) and it’s stellar companion. 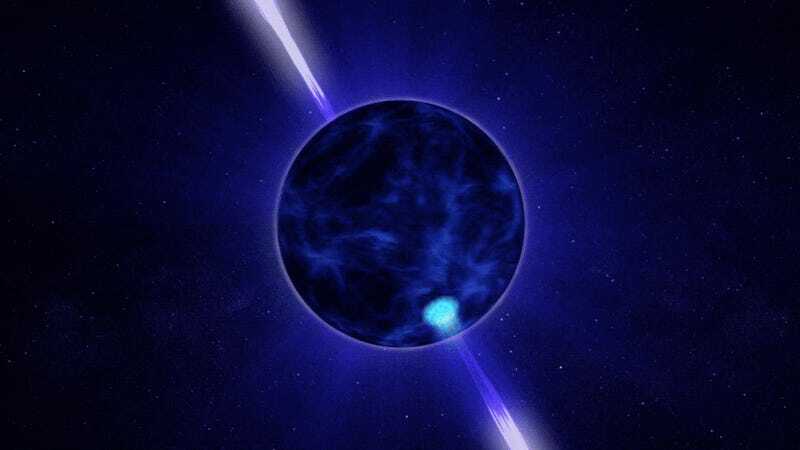 PSR J2215+5135, as the newly described neutron star is called, is what astronomers call a “redback” pulsar (the terms “neutron star” and “pulsar” are often used interchangeably, though technically speaking pulsars only describe rapidly rotating neutron stars). Redback pulsars are compact binary systems in which a spinning neutron star is closely orbited by a low-mass main sequence star. 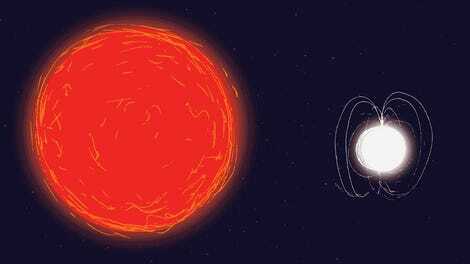 These companions to neutron stars are blasted by the radiation that pours out from the pulsar, making it difficult for scientists to distinguish between the two objects, which in turn makes it difficult to determine the mass of either object. Researchers from the Astronomy and Astrophysics Group of the UPC and the Canary Islands Institute of Astrophysics recently developed a new technique that allowed them to measure the mass of a neutron star in a compact binary. To do so, a group of telescopes was used to hone in on the pair: the Gran Telescopio Canarias (the largest optical and infrared telescope in the world), the William Herschel Telescope, the Isaac Newton Telescope, and the IAC-80 telescope. The astronomers, led by UPC physicist Manuel Linares, also used computer models to simulate the objects and study the radiation patterns endured by the pulsar’s stellar companion. This approach allowed the researchers to measure the speed at which the companion star moves in its orbit, including the speeds observed at the star’s brighter and slightly dimmer sides. By measuring the drastic temperature differences between the cooler/dimmer and hotter/brighter sides of the companion star, the researchers were able to infer both the velocity of the neutron star and its mass. The bright side, which faces the pulsar, was measured at 8,080 Kelvin (7,807 degrees Celsius), and the dimmer side at 5,660 Kelvin (5,387 degrees Celsius). The objects are rotating around each other’s center of mass at 412 kilometers per second, or 921,618 miles per hour. Armed with these and other variables (such as orbital inclination), the researchers were able to establish the neutron star’s mass at 2.3 solar masses. With the discovery of PSR J2215+5135 and other exceptionally massive neutron stars, scientists have an improved understanding of how extreme these objects can get, and as a result they can learn more about the behaviors and interactions of particles within these environments. Scientists obviously can’t replicate the intense gravitational strength of neutron stars on Earth (that would exceptionally bad), but they can treat these objects as distant, space-based laboratories. For example, physicists would like to learn more about the interactions between nucleons—the neutrons and protons that form the nucleus of the atom—at extremely high densities. In this case, with a neutron star comprising 2.3 solar masses, it means the repulsive strength between particles within its core must be strong enough to keep it from collapsing further. According to the authors, this suggests that free quarks or other exotic forms of matter are likely absent inside neutron stars. Gravity can create some very strange things indeed, and as the researchers point out, their new technique could also be used to measure the masses of black holes and white dwarfs, both of which are very dense. Hopefully the new technique will be used to measure objects even more outrageous than PSR J2215+5135, showing the dramatic extent to which the laws of the universe can twist and contort matter.